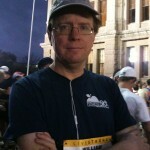 Just 10 days after finishing my first marathon last year I signed up for the 2011 Austin Marathon. 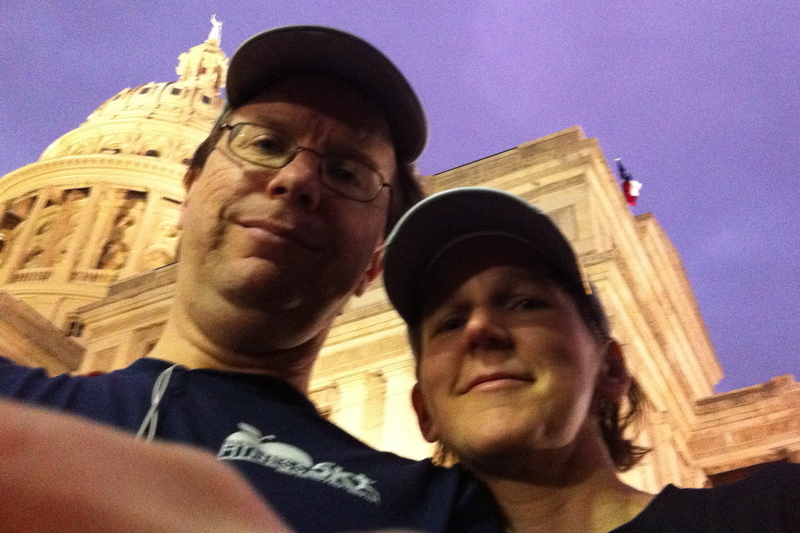 The next day I got a text from Bill wondering if he it would be crazy to sign up for the Austin Half Marathon. No way I said. 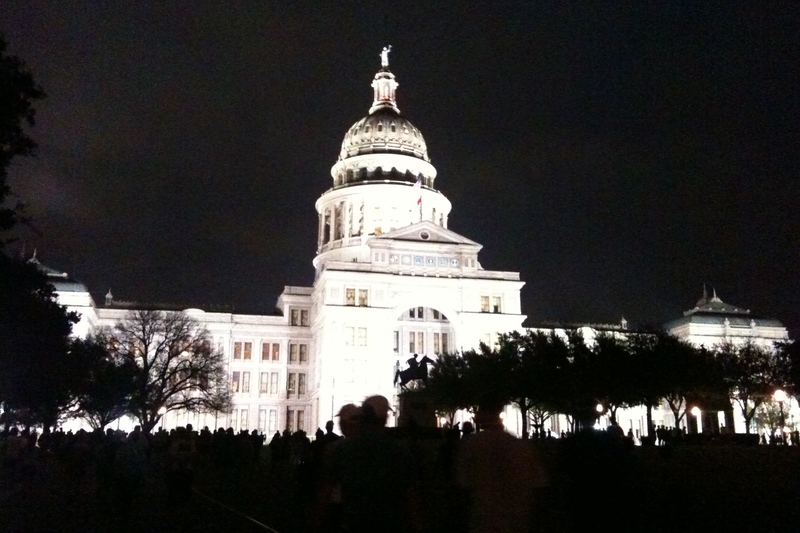 Neither of us can resist Austin, TX. 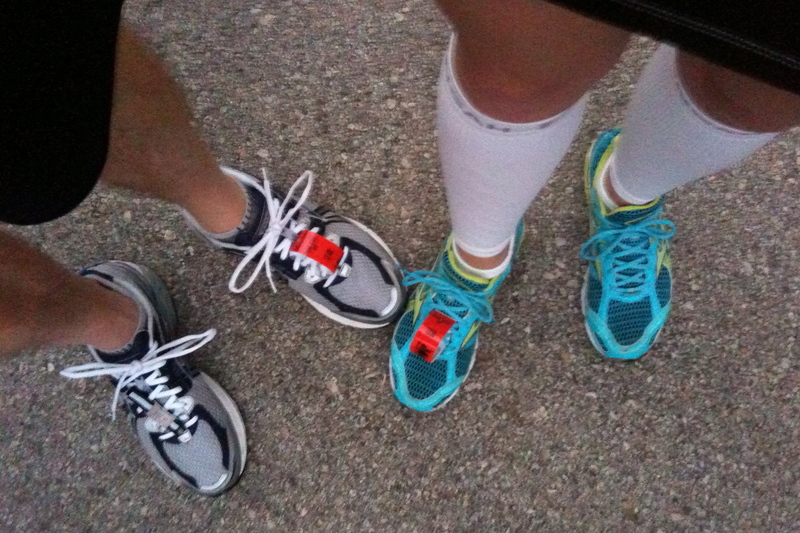 I hadn’t been this nervous before a race since my first 5K back in September 2008. The days leading up to this race, I wasn’t sure if I was going to be able to run, let alone finish due to the injury that popped up three weeks ago. This time around for my second marathon I chose to use a higher mileage training plan, the up to 55-miles/week 18-week plan from Advanced Marathoning. I had read enough about this plan to know going into it, it would be a big step up in my training. The mid-week medium long runs were my biggest challenge. Trying to fit in a 2-hour run before or after work was tough. But I was able to mostly stick to the plan pretty closely, even through the holidays. I’m now a big fan of Uncle Pfitzy! I noticed as the plan went along, my running felt stronger. And the 20-mile runs didn’t feel as exhausting this time compared to training for my first marathon last year. Things were looking great. I did my last 20-mile run on a Saturday three weeks out from the race, and it was a really solid run. I felt ready. But I had missed a 10-mile run that week, and tried to make up the mileage the next day on Sunday on top of my already scheduled run. Looking back, bad idea. I knew it. The following Tuesday’s run I was still incredibly sore. And by Thursday I knew I had hurt myself. 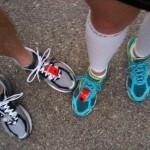 My left leg, mid-shin, had constant pain with every step I would run, beginning to end. By the end of the weekend, even brisk walking caused pain. The next Tuesday run was cut short and I was terribly sad. Less than two weeks before the marathon and I wasn’t getting better. All that work and I may not make it to the starting line. 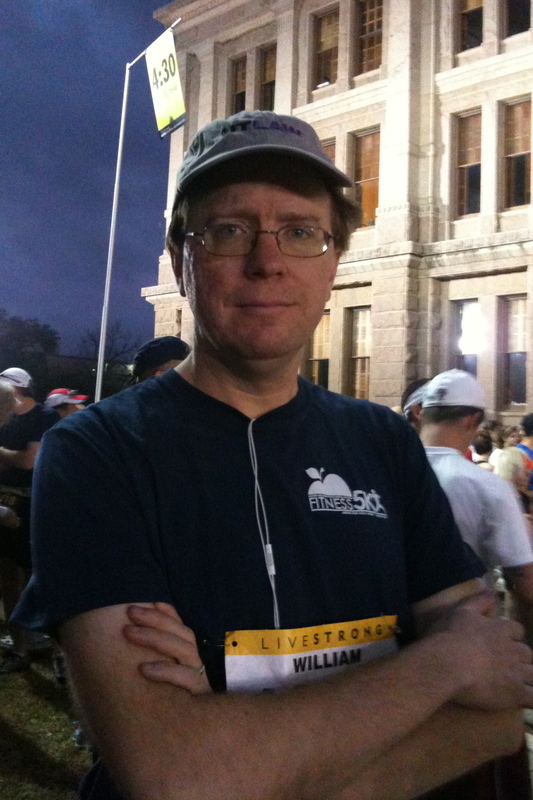 I wouldn’t get to run with Bill (his first half marathon). I cried, a lot. And the next day I went to get an x-ray. I couldn’t ignore the fact that I was injured. Work had been getting increasingly crazy and I had been working overtime for a couple of weeks now. My stress level was close to maximum and I wasn’t even able to run to help relieve any of it. I felt like I was going to burst. It was Thursday and I was looking forward to the weekend, catching up on some work, getting some extra rest, and trying to get my stress level back down. Then something happened that shifted my focus completely. I got a call from the mother of a good friend asking for my help. My friend’s health had deteriorated to the point where her husband could not care for her and their 1-month old daughter. They needed help with the baby. This was probably just about the worst time for me to be gone from work. But their situation sounded desperate. A few hours later my friend called asking for help. From the sound of her voice I knew I had to go. 24-hours later I was on a plane to Tulsa. These were some of the toughest three days of my life both emotionally and physically. It was hard to see my friend in so much pain. I was already sleep deprived when I got there, and the first night I only got 90 minutes of sleep. Their daughter is wonderful, but it was a big change to suddenly be caring for a baby 24 hr/day. And my back was telling me that I really wasn’t used to carrying a baby so much. By the time I had left Monday afternoon, my friend was in worst shape than when I had left. My x-rays had come back normal, and my doctor said to take it easy for a few days. Tulsa wasn’t easy, but I didn’t run at all and only got to go on two short walks, still feeling pain in my leg with walking. Back home I only had three days to squeeze in as much work as I could before leaving for Austin. Still no running or even time to get on my bike for some easy riding. 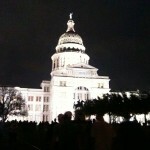 Friday we arrived in Austin, sunny and beautiful. But the one piece of luggage we checked (which included all of our toiletries, my gels for the race, and most of my clothes) somehow made its way to San Francisco instead. I had made sure there were a couple of key things not in the checked bag such as my running shoes and Garmin. It turned out that we didn’t get our bag until late the night before the race. So we spent some of Saturday buying a few things that I wanted for the race. I would have rather been sitting somewhere with my feet up, relaxing and knitting. Next time, I will make sure I have everything I need/want for the race plus a change of clothes not in a checked bag, lesson learned. This was more stress that I wasn’t looking for. Friday before dinner I was ready to test my legs to see if it was going to be possible for me to at least start the race. I did an easy 4.5 miles around the neighborhood at dusk. 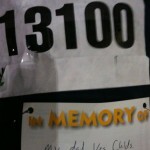 My leg pain was still there, but it never got worse or better as I ran. And it felt better than my last run which had been 10 days before, by far my longest not running since I started running. It felt so good to be able to run again, despite the pain, good to sweat and good to move. That night I finally slept really well. It had been awhile. Saturday afternoon we dropped off the kids at a friend’s house. That evening Bill and I ate at an Italian restaurant with our friend Katherine and some of her friends that were doing the half marathon. It was a nice, relaxing evening. Before bed I set out what I was going to wear for the race: Mizuno Wave Elixir 6 shoes, Injinji socks, Zensah Calf Sleeves, Atalanta Commitment Skirt, Moving Comfort Alexis bra, Asics Ecoline Sleevless top, Brooks Mesh Cap, and of course my new Garmin 310XT. I got to bed by 9:30, but didn’t sleep well. I knew I was going to start the race, but I didn’t know if I was going to turn right at 10.8 miles and follow the half marathon course to the finish or turn left and follow the full course, hopefully to the finish. The next morning I was up by 4:30, eating and drinking my usual cereal and chai tea. But I forgot my banana. Bill couldn’t find coffee filters and had to find a 24-hour place to get his coffee. I knew drinking his coffee this close to the start time meant he’d be stopping at a porta potty on the course. Once we parked and got out of the car I noticed how windy it was. I grabbed my throw-away shirt to keep warm. 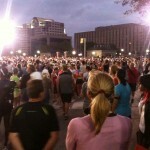 Dropped off our gear bags, stopped at the porta potties, and made our way to the start area. I was nervous and excited. It was probably around 63° at the start, a little on the humid side, but cloudy. Turning the corner onto Woodrow was so exciting. I knew we would be heading south the rest of the way to downtown. But that is also when I turned into a terrible head wind. It felt good cooling me off a bit, but really felt as if it was pushing me back. I kept my head low and pushed through, trying not to let the wind whip my hat off again. As I reached the water stop on Arroyo Seco, I could see Ella and Liam enthusiastically passing out water to runners. I reached Liam first where he said “Good job!” and gave me water to drink. I walked through most of the water stops instead of running, but here I took even more time, hugging my kids, saying hi to my friends. They had some animal crackers and bagel chips in baggies; I chose the chips, something not sweet with crunch is what I thought I wanted. But even better was the cold, wet washcloth. I wiped my face and arms and it felt amazing. I even took the time for a picture with Liam. And then I was off again. Now comes the geeky number talk. My final Garmin distance was 26.48, a little off of 26.2 miles. 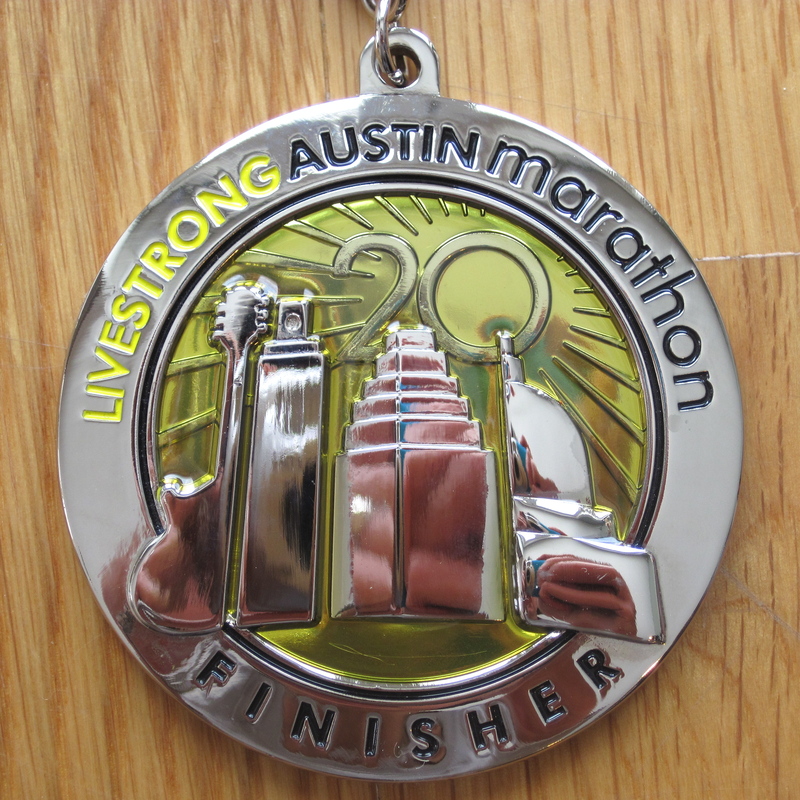 Final marathon time was 4:30:33, just 43 seconds slower than my first marathon. Here are my mat splits and rankings. I love a negative split race. For the Vermont marathon, my overall rank was the top 61% and age group rank was top 50%. No PR for me, but definite progress. So what’s next for me? I’m not actually sure. I’ve signed up for a half marathon in July that I got a free entry to. Otherwise nothing is on the schedule. 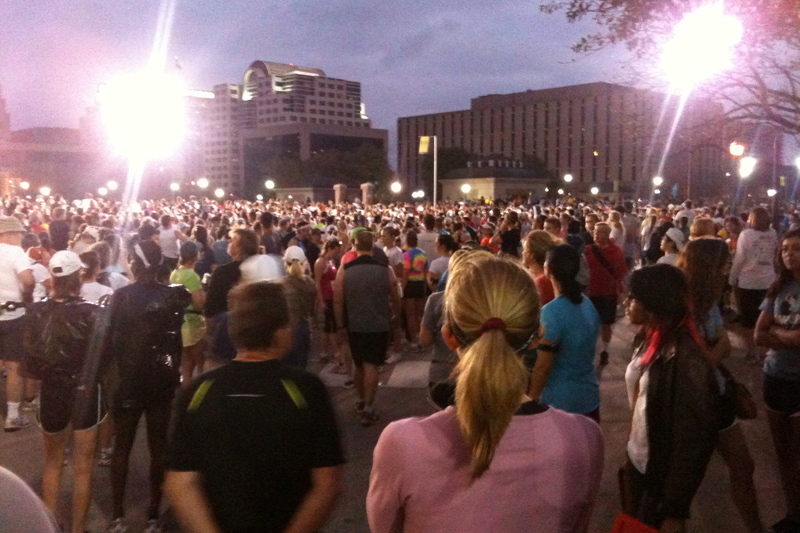 I know I would like to do another marathon in the fall. I’ve entered the lottery for New York, but assume I won’t get in this year. 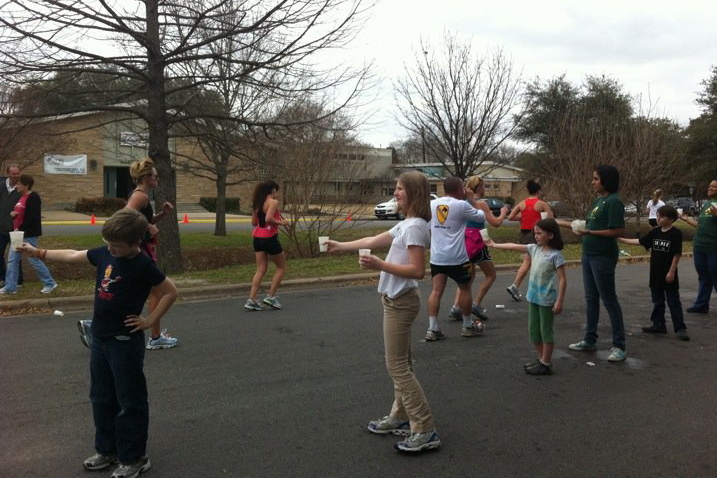 There are lots of more local marathons I can choose from too. I’m also toying with the idea of doing the USA Triathlon Age Group National Championship in Burlington in August. It may be a stretch to qualify, and if I do I would be at the back of the pack. But it would be a lot of fun and an opportunity like this may not happen again. So until I get back from SXSW next month, I’ll take it easy and get my leg to heal fully. 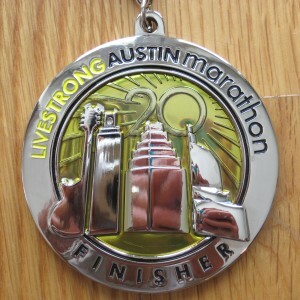 I’d like to do a Half Ironman (70.3) someday. But I’d really like to do it under 6 hours. I have a few things I want to accomplish before I would sign up. I’ve already gotten my half marathon time under 2 hours, twice now, last time on a hilly course. I feel good about my run. For the bike I want to work on my overall speed. How I’m going to do that I’m not sure: cadence work, longer rides, and a lot more time on my bike? Betty still feels so new to me; I know there’s room for improvement. Attempting NCC B rides last year didn’t work out great. They were usually a bit faster than I was and I would always get dropped. So I need to try to do more this year. The swim is my weakest part of triathlon. I still don’t feel comfortable in the water. My endurance in the water is not good either. I think some swim lessons this year and a lot more time in open water will help a ton. I was actually really happy with my swim times last year, but I would love to feel a lot better getter out of the water. I would also like to do more Olympic distance races before attempting a 70.3. I’m looking forward to spring, more time in the pool and on my bike. And I want to work strength training back into my schedule. I dropped it completely with my marathon training. With the higher mileage, I didn’t have the energy or time. But now that I belong to a gym again, it would be fun to work more of my body than just my legs. Once my leg feels good enough to start speed work again, I’ll enter a few local races. But for now I’m going to enjoy a little down, finish up some lingering knitting projects and relax. Then I’ll be able to jump into my next training schedule full of enthusiasm. 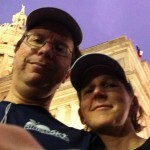 You can view photos and video (good and bad) of Bill and me on the Action Sports site. Dena, You are awesome! 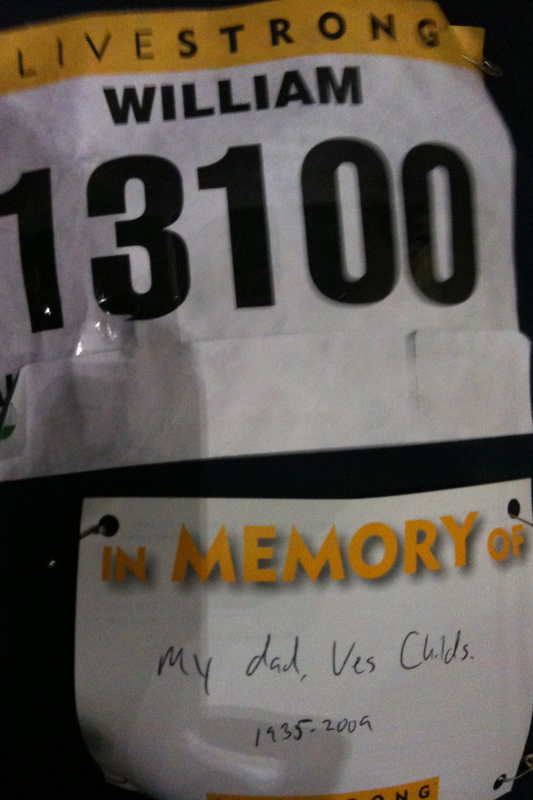 Such an inspiring race report… that you were able to run that well with all that crap behind you says a lot. 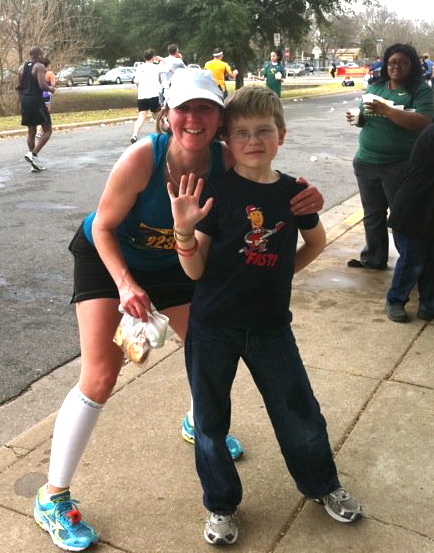 Your next marathon is going to be a huge PR, I’m sure of it!!! Oh, Dena– what a story. You continue to be an inspiration! Hope life gets simpler and you get back to MASS for more rest and time for yourselves. Bravo Bravo! Keep up the good, hard work.